Linux Mint. Positively the best operating system. Ever. File management programs are not glamorous, but they do an important job. Caja (Spanish for ‘box’) does its job well. It opens by default on a panel with a menu bar, toolbar and two panels; a list of ‘Places’ – disks, partitions or folders – at the left and a list of files and folders located at that ‘place’ on the right. The left panel can be set via a drop-down menu to show information about a folder, a more complex tree structure, a ‘History’ of places you’ve been recently, a written set of notes relating to that particular place, or a set of ‘Emblems’ you can drag-and-drop to replace the default icons for folders or files. The view in the right panel can be altered to one of three Views shown at the bottom of the View menu – Icons, List or Compact view. There’s also a drop-down menu for these in the toolbar. You can move files into folders by dragging them around in the right panel or from right to left. Hold down the Ctrl key while dragging to make copies instead. A set of ‘breadcrumbs’ at the top of the panel shows where you are on the system. Click here to retrace your steps back up to the root directory. A toolbar button with the silhouette of a computer monitor will open a Windows-style view showing disk partitions and removable storage as separate icons. Normally these are accessed from within the /media directory – see below. Double-click on a folder to see the contents. Double-click on a file to open it, if you have an application that will do so. You can also right-click on a folder or file to open a local menu relating to that item. The Caja File menu allows you to open a new window or a new tab in the same window. Files can be moved or copied between windows by dragging. To move or copy a file in tabbed view, drop it on to the tab for the folder to move it to. You can create a new folder or various kinds of blank documents, or connect to a network server – see ‘Networking’ above. You can empty the Trash, or open a terminal window in the current folder. The File menu also allows you to view the Properties of a selected file or folder. The ‘properties’ of a file or folder are the things you or Mint might need to know about it – it’s size, name, location and modification date, for instance. Some of these can be changed if you have the necessary user privileges, including the name, the emblem or icon with which it appears in Caja, and the security settings. In other words, if you run Caja as root, you can change the settings on a locked file or folder so that <username> can open or modify it. This is necessary if your disk is divided into several partitions, for instance, since anything outside the Home partition will start off accessible only to root. You can also use Properties to determine which Mint application opens this kind of file – e.g. whether PDF files open in Document Reader or Adobe reader. Along with the usual options for selecting, copying and pasting, the Edit menu in Caja contains a ‘Make Link(s)’ option which is active when you’ve selected one or more files or folders. A ‘link’ in Linux is the same kind of thing as a ‘shortcut’ in Windows – a pointer that connects up to a particular file or directory but can be stored somewhere else; on the desktop, for instance. If you create a link to a file or folder it will appear first in the same location; but you can then drag it to the desktop or a panel to create a ‘launcher’ which will open that folder or that file when it’s double-clicked. Links can also be moved or copied between folders; so if there’s a particular file you often use while you’re working with that folder, you can include a link to it in there. Links can be identified by the words ‘Link to’ preceding the name, and a little curved arrow in a box that appears on a link icon. You can change either of both if you want to. What links really are is small files containing a line of text which identifies the item they point to. Links can be deleted without affecting the files or folders to which they point. Preview sound files – if this option is on, Caja will begin to play sound files when you hover your mouse over their name or icon. Plugins – like many Mint programs. Caja can be supplemented by special-purpose plugins which extend its capabilities. Like Caja themselves, these are free, and some may be useful to you. Searching for ‘caja’ in the Synaptic Package Manager will list those that are currently available to install. Caja is a good place from which to explore the way in which Mint organises its file system. Most of this arrangement grew up organically in the days of UNIX, and it can be confusing for a beginner. Here are some of the more important locations. Click on ‘File System’ in the left panel, and you’ll be taken to the root directory. / The root directory, the ‘container’ which conceptually holds everything else on your system, even external disks and network shares. /bin Short for ‘binary’. The bin directory contains program files relating to the operations of the Mint OS. Similar files for user-installed programs can be found in /usr/bin. /boot Files stored here are used in the booting up process. One of them is a link to ‘vmlinux’, which is the Linux kernel. /dev All input and output devices are managed by Linux systems as if they were files with constantly changing contents. Opening the /dev directory will show links to the DVD drive and the hard disk (usually sda) as well as many other unrecognisable real and virtual devices. /etc Configuration files for the Mint system. As we’ve already seen, these include the settings for Samba connections to Windows networks and the /etc/fstab file for mounting external shares, as well as much more. /home Where user directories are stored. Anyone with a user account on this PC will have their own folder in the /home directory. /lib, /lib32, /lib64 ‘Libraries’ of shared resources available for use by any program on the system that needs them. /lost+found In the event of a system crash, any data that can be salvaged is stored here. It may or may not be useful in repairing the damage. /media The directory from which subfolders link to data storage devices. If you have several disks, or one disk with several partitions, Mint will make a subfolder in /media for each one. /mnt This (‘mount’) directory originally performed the same function as /media. Now it is mainly used for subfolders linked to mounted network shares. /opt A directory for optional programs – i.e. those that aren’t officially part of the open-source Mint universe. This may include purchased games or proprietary programs like Google Earth. /proc Mint likes to think of everything as a file, including the processes that are taking place within the PC. /proc is a holding directory for transient files that store the current state of Mint’s internal processes – a kind of computerised superego. /sys Yet another location for storing system information. /tmp A temporary holding space for programs that need to dump data. /usr Configuration files for interactive programs – i.e. those that somehow communicate with the user. /var A directory for storing variable information. This includes the minute-to-minute reports on user activities, system actions and so on, referred to collectively as ‘logs’. The /var directory may also be used for email unless you specify otherwise. You don’t have to know much about any of these to start with, except that external storage devices like memory sticks will be in /media, and external network shares will probably be in /mnt. Mint should create a desktop shortcut to the share, or open a window on the screen showing the memory stick contents when you insert it, so you should be able to access them directly most of the time anyway. I’ve already indicated that there are many hidden files and folders on Mint, especially in the <username> directory. What makes them ‘hidden’ is that their names start with a full stop character. You can make any file or folder of your own hidden by adding a full stop to the start of its name, and make hidden items unhidden by removing the full stop – although that might make your programs object when they can’t find the settings they’re looking for. 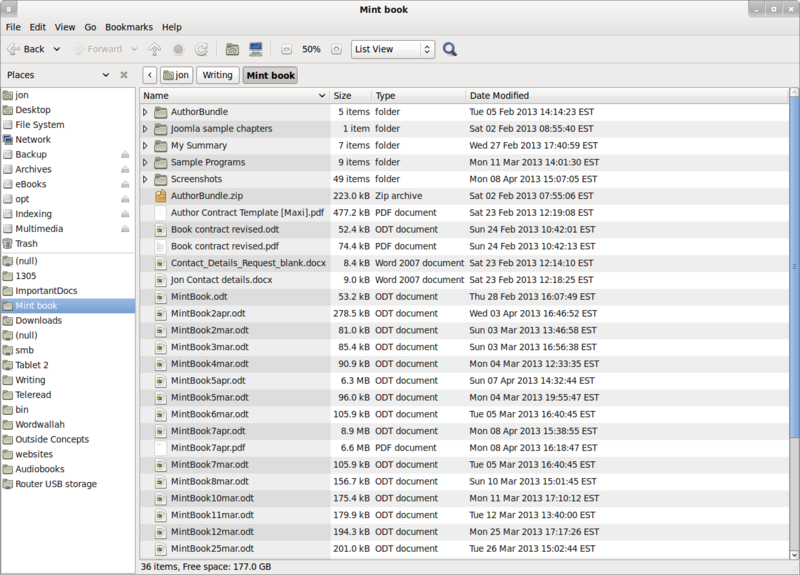 To see or hide hidden files and folders in Caja, press Ctrl-H or use the View menu. The equivalent key in KDE Dolphin is Alt-[Full stop]. The Caja Go menu is a list of places Caja thinks you may want to go to. It’s not particularly useful, though it does keep a record of places you’ve been recently. The View menu in Caja allows you to zoom in and out. This can be useful in viewing a directory containing photos, for instance, since Caja uses a thumbnail image of the photo itself as an emblem, and zooming in will make this larger. Bookmarks are locations that you may want to go back to. They are listed alphabetically at the bottom of the Places panel on the left. To add a bookmark, go to that location, open the Bookmarks menu and select ‘Add’. To remove a bookmark right-click on it and select ‘Delete’ or go to ‘Edit Bookmarks’ in the Bookmark menu and remove it from there. The Caja Toolbar contains navigation buttons for going back to your previous locations and forwards again, or up to higher-level folders. There’s a Stop button for halting procedures like file transfers if they’re taking too long or you change your mind, and a Home button to take you to your <username> directory. The button with a monitor picture shows you disk drives and other storage media as external elements, though to Mint they are still ‘really’ subfolders under /media. Confusingly, there are two sets of magnifying glass buttons; one pair to zoom in and out with, and another to search file names in the current directory (and subdirectories). This larger magnifying glass will open a search panel at the top of the screen. Type in your search term and press Enter to see a list of matching folders and files. The Help menu in Caja opens a link to a site where you can download the official Mint installation manual. This is a useful document, but it’s not really the solution to a crisis. It often hangs for me both in mint 15 and 16 when moving/copying thousands of files at a time. Dolphin on the other hand does this veeery quickly without any problems. Pingback: From Mint 16 Petra Mate Edition to Ubuntu 13.10 with Mate Desktop Environment | In brief. David Ing. I like Caja but is there a way to make it highlight the folder you are dropping files into. In Nemo and windows when I am viewing a folder contents and want to drag files to a folder in the tree on the left they highlight the folder that will be dropped into. IS there a way to alter the permanantly change the copy command in the drop box of caja options. I’d like to alter the copy command to copy -p to preserve the permissions as I move files from disk to disk. It’s a real PITA to always have to reset the permissions just because I moved the folder/files. Ever time I open CAJA I have to reset column widths, is there a way to”Set and fix”?